Monza's long flat-out straights force Formula 1 teams to think more about drag levels and trimming downforce at the Italian Grand Prix than elsewhere. Straightline speed becomes essential, but focusing on it can make life tricky when downforce is required for the chicanes. It sets the scene for the most outrageously low downforce rear wings seen all season, most of them designed specifically for the famed 'temple of speed' and instantly obsolete after the race. 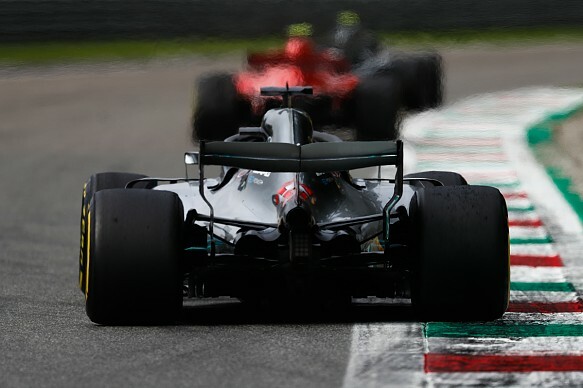 Punching a hole in the air is a much easier task for the leading Mercedes and Ferrari teams, due to their extremely potent engines. So while they both sported 'skinnier' wings for the Italian GP, their designs were not as extreme as some of the other teams. 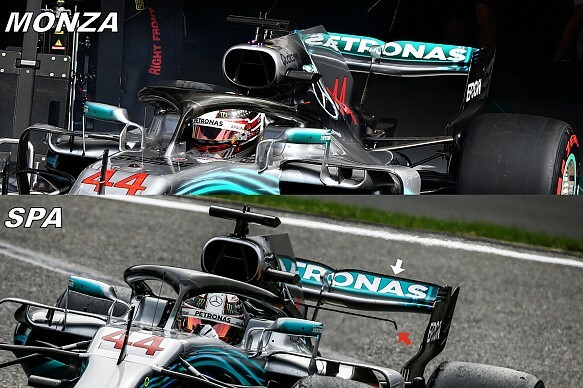 In fact both teams opted for a more aggressive variation of the wing used in Belgium, with Ferrari favouring a more traditional flat design, whilst Mercedes utilised a 'spoon' style wing. 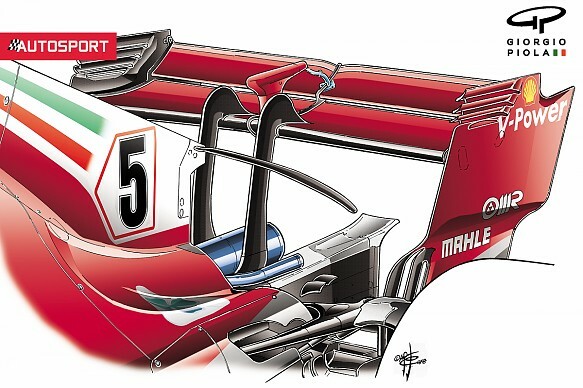 Although Mercedes tested two different specification of wings in Belgium, in the end it opted for its lower downforce variant, paired with the usual T-wing configuration (red arrow). For Monza a similar rear wing configuration was selected, albeit without the Gurney flap on the trailing edge (white arrow). To boost straightline speed the T-wing was discarded entirely. Like Mercedes, Ferrari made only small alterations to its rear wing at its home grand prix, but it was able to retain its T-wing - which wild have provided its drivers with more downforce and confidence for fast corners such as Parabolica. What comes off one end of the car generally needs to be balanced at the other too, and given cars don't need to be 'on the nose' in quite the same way as they would for the second sector at Spa, both teams made concessions in this regard for Monza. 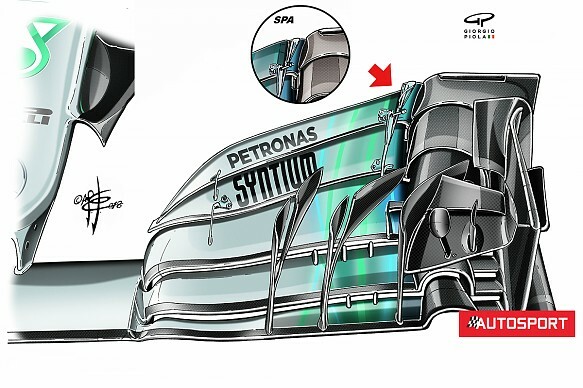 Mercedes gave the trailing edge of its upper flap a trim (red arrow) compared with Spa (inset). This is a tactic employed by the teams when the angle of the wing is already close to, if not at, its operating limit. 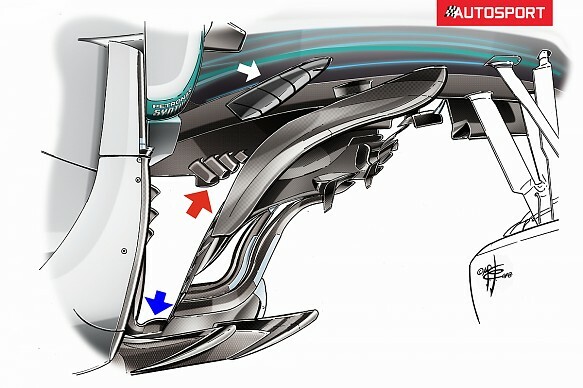 Interestingly Mercedes also made some improvements to its floor, altering the shape of the axehead that flanks the car (blue arrow). Also, the slotted splitter section (red arrow) has been optimised further, with corresponding slots having to be made in the chassis canard above (white arrow) to comply with the regulations. Red Bull's weaknesses are exposed at high speed circuits, such as Spa and Monza, and so the team reluctantly has to make amends for its engine deficit by relinquishing some of its aerodynamic performance. A superior ability to generate downforce from the underfloor and diffuser have always allowed Red Bull to skew its rear wing offering compared to Ferrari and Mercedes, but over the last two races it's been even more extreme. 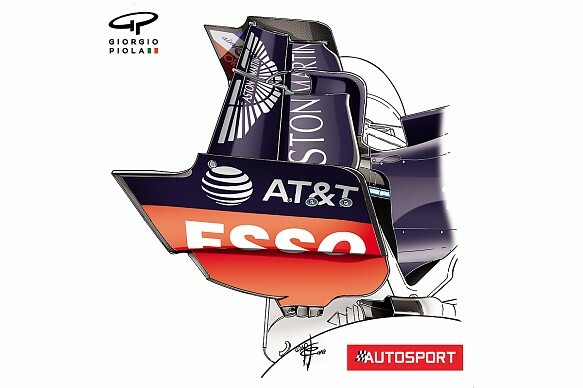 The wing is so shallow that the placement of louvres in the upper leading corner of the endplate is considered irrelevant. And while the wing already appeared to be extremely flat at Spa, the designers went that extra mile for Monza - reducing the angle of attack further and sweeping the outer leading edge of the mainplane backward.